Make pairs of assets - cover yours - steal theirs - 1st Millionaire wins! 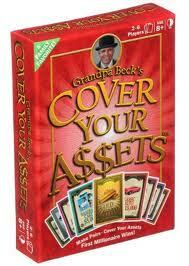 Cover Your Assets is another card game from Grandpa Becks Games of Seattle, Washington. Grandpa Becks Games is a husband and wife team creating card games that are family fun. Their belief is that time spent playing games is time spent building relationships. Cover Your Assets is a fast paced card game where the first player to amass $1,000,000 in assets is the winner. Players make pairs of the same asset cards and place them in a stack, face up on the table, in front of them. Future pairs are placed on top of their pile horizontal to the pair beneath, to keep sets separate. This is how you “Cover Your Assets! During the course of a game, players will play matching pairs of asset cards building their pile of assets, draw cards from the discard pile to match with ones in their hand, and challenge their opponents in an attempt to steal their assets from the top of their pile. The key is to have the right cards in your hand to defend your asset pile while building your pile. But watch out, your opponent may have the cards to counter your defending cards and steal away your asset. This is a game with a lot of interaction, you’re constantly trying to steal or defend and with lots of laughs on the way to obtaining a million dollars. We have an open copy of Cover Your Assets available in our Store Demo Library for you come in and try out.